America – are you woke? Now that the first wave of Women’s Marches is over, Americans must prepare for the difficult work of solidarity. 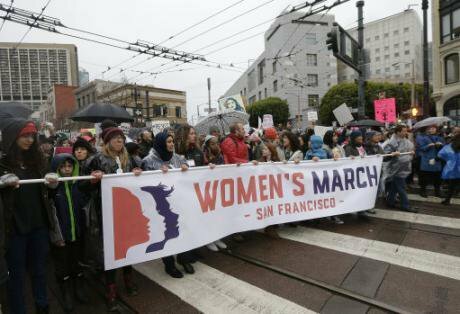 An estimated 150,000 people turned out for the march on Saturday 21 January in San Francisco despite the pouring rain – one of 673 marches reported to have taken place in the US. No, not a line of dialogue from a post-dystopian feminist novel, but a tongue-in-cheek question at a pre-Women’s March screen-printing party. Stylised wombs, some designed with the word ‘uterati’ emblazoned across them, were the order of the day. We printed them on our t-shirts and sweatshirts to wear at the San Francisco Women’s March. 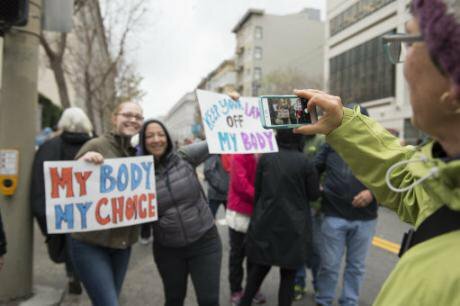 The focus on wombs was, in part, a riposte to the strong anti-abortion movement in San Francisco, March for Life, which was organising a pro-Trump march earlier on the same day. It was a very San Francisco event, run by the Women’s Community Clinic: DIY, socially aware, diverse in many ways. There was food, there were dogs. There were diverse, socially aware dogs. And there were a group of committed women who provide healthcare ‘by the community, for the community’. A week later I was at Jenni’s placard-making party. I was impressed at the energy and commitment. I showed up with oil sticks - others showed up with spray cans and exacto knives (Stanley knives). It was a friendly crowd and while we discussed what slogans to write, paint or spray on our placards we didn’t talk much about why. We turned to the internet for inspiration, so that something that had appeared in London or Manchester in England, in the morning was seen again on a different placard in the US in the afternoon. Unlike Donald Trump we were participants in our own progressive brand of globalisation, but I missed the local flavour of political placards and the way slogans can reflect the zeitgeist. The march itself was loud, the weather was wet and soon – so were we, along with our banners and placards. There were people who’d never attended a protest before and people like me, who’d attended many. I asked one young woman, Ali, what made this protest the first. She came because "everyone was talking about it". She knew when it was happening and why it was happening and her friends were attending too. At the march, chants and placards addressed a multitude of issues. One of them was healthcare. I thought of the 20 million (approx.) people who’d lose their access to healthcare if/when the Affordable Care Act (also known as Obamacare) is repealed. To put this in context, I’m one of the lucky ones whose health insurance is provided by my employer. When I go to the doctor I have three cards in my hand; my ID, my medical insurance card and my credit card, because you need to make a small payment each time you see the doctor. So having health insurance doesn’t mean your healthcare is ‘free’, it means it’s subsidised. When I had to pay for my health insurance individually for one month, it cost me $550, not including dental or vision insurance. I have asthma and my asthma inhaler usually costs me $20.00. I was told if I bought it without insurance it would cost me approx. $490.00. For one inhaler! That helps me to breathe. And I think about those people, the 20 million who will lose their health coverage. And I wonder about the hard choices an individual or a family will have to make if they are not in jobs that provide healthcare (lower paid jobs sometimes don’t). If you have to buy an asthma inhaler for $490 what do you have to sacrifice? Heat? Food? Transport to work? Clothes for your children? 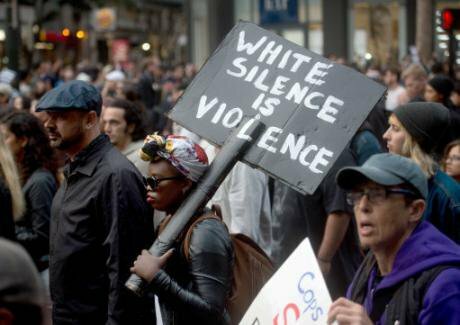 Another statement on the placards, including my own, was ‘Black Lives Matter’. When he was first elected, I feared that the only way Obama would leave the White House would be in a wooden box. I breathed a sigh of relief when those fears were not realised, but watched in horror as other African-American men, and women and children were shot and buried, shot, videoed and buried, videoed being shot and then buried. The nightmare just kept looping round, and much of the United States turned away. When I went on a Black Lives Matter march in East Oakland (near San Francisco) it was not well attended. Ninety per cent of those attending were African-American, many of them mothers of young, sometimes very young, men who had been shot and killed by the police. They spoke passionately and eloquently, with dignity and grace. But the crowds were not there, to be galvanised by their words and their pain. So what happened, I wondered, that brought people out in such high numbers to the Women’s Marches in Oakland and San Francisco but in much lower numbers to the Black Lives Matter marches in both cities? To say that people in the United States have different narratives about what is going on in this country is an understatement. It’s true in Britain as well. Brexit – a protest vote gone wrong. A reflection of a country divided, where urban elites who live near the seat of power dismissed the disenfranchised rural poor (and not so poor) at their peril. Donald Trump – a protest vote gone wrong. A reflection of a country divided…. you get the point. People are outraged here, and unified now, against Trump. It’s a hegemonic alliance and we know what happens to those. Opposition is not enough. Now it’s time for the hard work of solidarity, the difficult conversations across race and class, gender, sexuality and more. It’s about the hard work of building and sustaining a movement. Are you ready, America - are you ‘woke’?